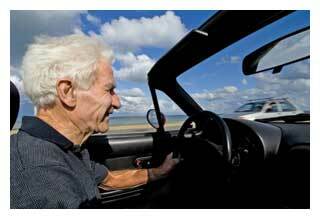 Are driving requirements different for seniors? No. But you cannot renew your driver’s license by mail after age 71 unless you submit a statement from a licensed medical doctor that you are physically able to operate a vehicle safely and a report from a licensed ophthalmologist, optometrist or doctor regarding your eyesight. 3) a mental or nervous disorder which is likely to interfere with driving; or any other medical condition which could impair your ability to drive safely. The DMV can also refuse to issue or renew your license if your corrected vision is not at least 20/40 in both eyes. Any person with 3 DUI convictions in the last 4 years will not be issued a license or have a license renewed. Can someone report me for bad driving? Yes. The police, medical experts (including eye doctors), health institutions, and the Courts can give information to the DMV regarding health or other conditions which cause a driver to endanger public safety. The DMV may then investigate these reports. In addition to the people listed above, anyone can submit a statement under oath to the DMV regarding a driver’s physical or mental capabilities. The DMV can take action based on this type of report as well. Can my license be limited, rather than suspended or revoked? Yes. Your license can be limited to require the use of glasses, telescopic devices or additional rear view mirrors. Specialized additions to vehicles can also be required, such as hand-grips, left foot accelerator pedals or other modifications to the car which make it easier and safer for you to drive. In addition, the DMV can limit the number of days you can drive, the hours of driving (for example, day time only), where you can drive or how fast you are allowed to drive. If you are permanently disabled, you can qualify for license plates or permits which let you park in designated handicapped spaces. You must be certified by a doctor as having health conditions which limit your ability to walk long distances, such as a lung disease or a heart condition. If your disability is temporary, for example, as a result of a surgery, you can obtain a placard which hangs from the rear view mirror of your vehicle. (For more information you can go to www.dmvnv.com/platesdisabled). Some communities may provide public transportation for disabled persons. Check with your local senior center for more information. Usually such transportation requires a reservation made a day in advance so scheduling can be done. What do I use for identification if I don’t have a driver’s license anymore? If you surrender your driver’s license or no longer drive, you will still need an ID card. If you are giving up your Nevada Driver’s license, you will not need separate proof of name, date of birth or Social Security number to get the ID card. You can get an ID card at the Nevada Dept. of Motor Vehicles. If you did not have a Nevada Driver’s license you will need to show a birth certificate or an equivalent form of identification. Many seniors have decided to stay on the job or even return to a job full-time or part-time. Many others volunteer for organizations, churches and schools to keep busy and give back to society. Can I be turned down for a job because of my age? No, an employer cannot fire you, deny you a job or discriminate against you simply because you are over 40. Nor can an employer turn you down for a training program or educational benefit simply because you are over 40. If you experience such discrimination, you can contact equal opportunity. Will I lose my Social Security benefits if I am working? No, not if you have reached full retirement age (between 65 and 67, depending on your birth date). If you wait to claim Social Security benefits until age 70, you will receive a larger monthly benefit check, regardless of any additional earnings. However, if you collect Social Security payments before you reach full retirement age and earn additional income, your benefits will be reduced if your earnings exceed a certain amount. For more information you should contact your local Social Security Administration office.